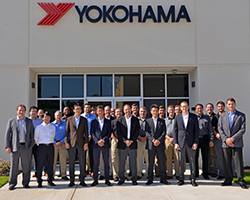 Yokohama Tire Corporation officially opened its new tire research and development facility – the Yokohama Development Center America (YDCA) – in Cornelius, North Carolina. Local officials joined Yokohama executives for the ribbon-cutting festivities. The high-tech, 25,000-sq.-ft.-building in Mecklenburg County, replaces the temporary R&D office Yokohama has utilized in Concord, North Carolina since 2016. The Cornelius facility will consolidate separate R&D staffs currently operating at a number of locations throughout the U.S. and will be led by Shoichiro (Sho) Matsuda, YCNA vice president of corporate technical. “Our primary focus here will be tire development,” said Matsuda. “We will also support other technical groups such as quality assurance and technical services.” Thomas Kenny, director of consumer tire development, Dan Steltmann, director of commercial tire development, and Jeremy Kahrs, director of technical service, will all be based out of the company’s new location.